There comes a point in a ukulele player’s journey where one must face head on, with courage and bravery, that dreaded and difficult-to-play E major chord on ukulele. By learning the E chord on ukulele, you unlock a whole new world of playing songs on the ukulele with the most notable song using the E chord being Hey Soul Sister by Train. Don’t worry because together in this lesson we look at three of the best ways to play the E major chord on ukulele. I provide you with three variations of E major and give you the pros and cons of each, so you can learn how to play the E chord and determine which one is easiest for you. Watch the video and learn how to play E major on ukulele. To play the E major chord on ukulele in this first variation, place the middle finger at the 4th fret of the top g-string, ring finger at the 4th fret of the C-string, and index finger at the 2nd fret of the bottom A-string. Let the E-string ring open. To play the E major chord on ukulele in this second variation, perform a barre by pressing your index finger on the top g-string, C-string, and E-string on the 4th fret and place the little finger on the 7th fret of the bottom A-string. To play the E major chord on ukulele in this third and most popular variation, perform a barre by pressing your index finger on all four strings on the 2nd fret and perform a barre by pressing your ring finger on the top g-string, C-string, and E-string on the 4th fret. Be sure to watch the video to get tips for playing this tricky position. This fourth variation of the E major chord is the same chord as Variation #3 but uses a different fretting hand position. 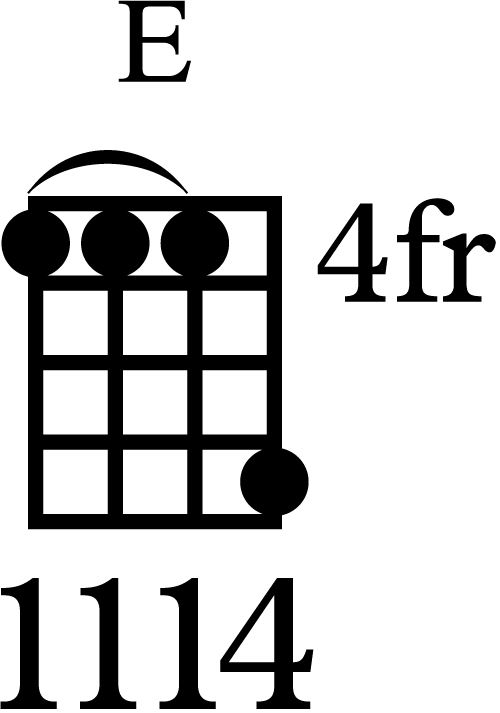 To play the E major chord on ukulele in this fourth variation, place the middle finger at the 4th fret of the top g-string, ring finger at the 4th fret of the C-string, little finger at the 4th fret of the E-string, and index finger at the 2nd fret of the bottom A-string. I recommend using this Variation #4 if you have small hands and fingers, but for those of us with larger hands and fingers (like myself), learning Variation #3 is better. Was This Chord Too Hard to Learn? The E major chord on ukulele is infamous for being the hardest chord to play on ukulele. If you’re a beginner and this was too difficult, don’t be discouraged. I recommend starting in the free Learn to Play Ukulele Today video lesson course where I teach you easy ukulele chords and how to apply those to strum and play actual songs. My fingers are too small to barre the E major chord as in Variation #3 and too large for Variation #4. In Variation #4, instead of using fingers 2 and 3 to barre the 4th fret, I just use finger 3 to barre both the G and C. Pinky 4 still barres the 4th fret as you show. Produces a cleaner sound for me. Thanks for the well-produced lessons. Great work, Scott. You’ve outlined another practical example of finding an alternative finger position to make a chord playable. True. If you wanted to be technical, Variation 1 is known as an E5 chord, since it contains just the root note and fifth scale degree in the chord (E and B). However, it’s a very suitable substitution, especially for songs written in the key of E major. I never looked at it that way. Thanks. Great vid. Thanks for suggesting alternative finger placements. My fingers aren’t that bendy yet so I appreciate different positions to try. BTW, very cool uke strap. What is it? Can I order it? I use the “Uke Leash” brand leather strap. It’s awesome! Maaate …. the baritone gets no love from you …. how about incorporating big bad Barry as a supplement to its three spoilt cousins and share the love …. Easy peasy on a barra …. the e chord that is ! cheers big ears …. Ricky … Melbourne Australia.